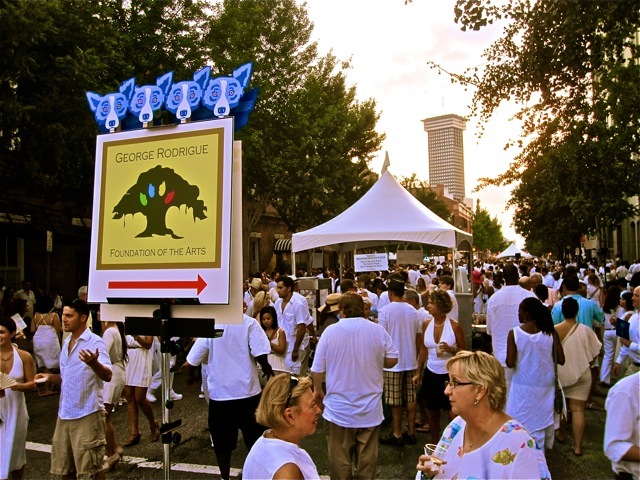 Updated 8/1/13: Don't miss White Linen Night 2013 on Saturday, August 3rd, featuring the George Rodrigue Foundation of the Arts in the New Orleans Arts District. Details at this link. 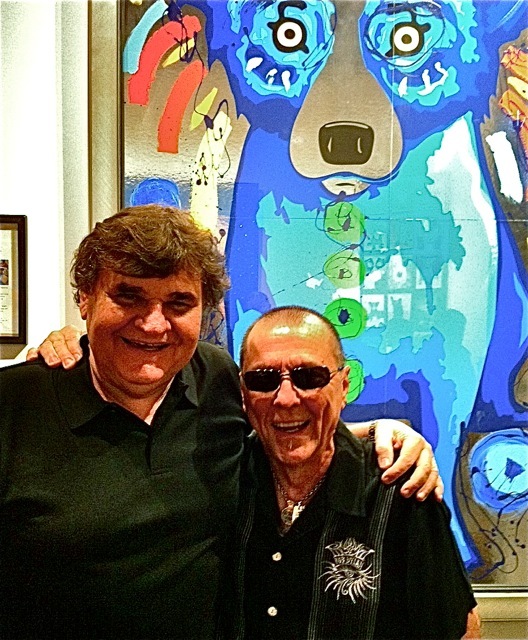 ....Followed by Dirty Linen Night at the Rodrigue Gallery, 730 Royal Street on Saturday, August 10th, 2013; details here. I wouldn’t exactly call it a Dirty Linen Warm-Up, and yet it was, in that it was quite warm. 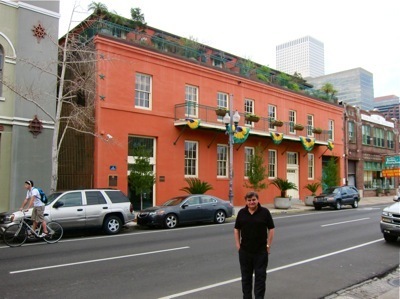 But the two events hold separate appeal, one amidst posh, renovated warehouses and the other within the historic and grittier French Quarter. This was our first White Linen Night as ‘locals’ of the New Orleans Arts District. We opened the doors of the George Rodrigue Foundation of the Arts’ Education Center at 747 Magazine Street only a few months ago, after nearly a year of construction and planning. “This is your most beautiful gallery,” a woman said, as I explained that it’s not a gallery, but a non-profit, where we operate scholarship programs, art camps, teacher workshops, George’s Art Closet and more. “You mean I can’t buy these?” asked another, as she admired an 8-foot chrome and acrylic Blue Dog, part of our ‘Art for Healing’ program. George designates such works for children’s hospitals, I explained, a nod to his childhood struggle with polio and his isolated, disturbing memories of peers in iron lungs. 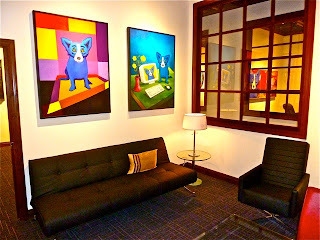 Today, he hopes the children and their families experience something positive, maybe even something fun, the colorful environment and giant Blue Dog painted alongside their reflection. “But where can we buy his paintings?” asked an elderly couple, looking dapper in seersucker and white lace. I suggested they visit our French Quarter Gallery, opened just over a year ago across the street from the small one-room gallery we occupied since 1989, now a blur as George paints large-scale canvases for the expansive new space. The people, 40,000 of them by some accounts, strolled in the balmy air of south Louisiana, all in white, like ghosts from a Rodrigue painting. It was a beautiful scene, and I enjoyed not only the view, but also the mood, an excuse to dress like Blanche DuBois or Joanne Woodward, to break up a long hot summer with sparkling, bottled tans and French manicures, with woven feathers mixed with freshly highlighted hair, with towering wedge-heels despite precarious sidewalks, and with the constant flicker of fans on glowing, smiling faces. 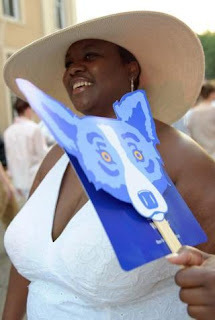 Despite one-per-person, we blew through 1500 Blue Dog fans in less than an hour, embarrassingly unprepared for this southern phenomenon. 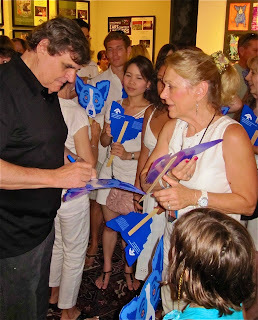 "We were shocked by the attendance and interest last night in GRFA," says Executive Director Jacques Rodrigue. "I'm excited to share the foundation with the public, and I can't imagine a better event than White Linen Night to get the word out. "People really responded to the programs and seemed eager to learn about our plans not only for arts integration in all subjects, but also our general support of the arts statewide. My only regret is that we ran out of fans. I'm already thinking about next year!" To my surprise, of the one thousand or more moist, extended hands and curious visitors, probably a third were tourists, most from far out of state – New York, Arizona, Tennessee, Pennsylvania, Oregon. I met schoolteachers on sabbatical, young people on a life’s quest, artists seeking inspiration, children visiting parents, and writers, filmmakers, musicians and more. “Who painted these?” asked a man, as he admired George’s portraits of authors Walker Percy, Shirley Ann Grau and John Kennedy Toole, hanging behind the desk of GRFA’s Director of Operations, Gus Anderson. “Where’s the Blue Dog?” asked another, as though it were hidden behind a tree. "Tell us about the trees!" 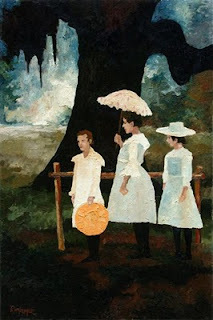 said one group, as I taught an impromptu class of sorts, explaining the importance of George Rodrigue and his oaks within the genre of Louisiana Landscape Painting. 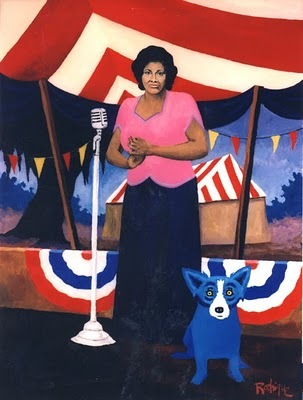 The biggest shock for locals came from the original painting of Mahalia Jackson, the Jazz Fest poster that never was, along with its story of predictable New Orleans politics (detailed here). “What are those?” asked hundreds of people, pointing to the Hurricanes, painted years before Katrina, and swirling across the walls of GRFA’s Education Director Marney Robinson’s office. 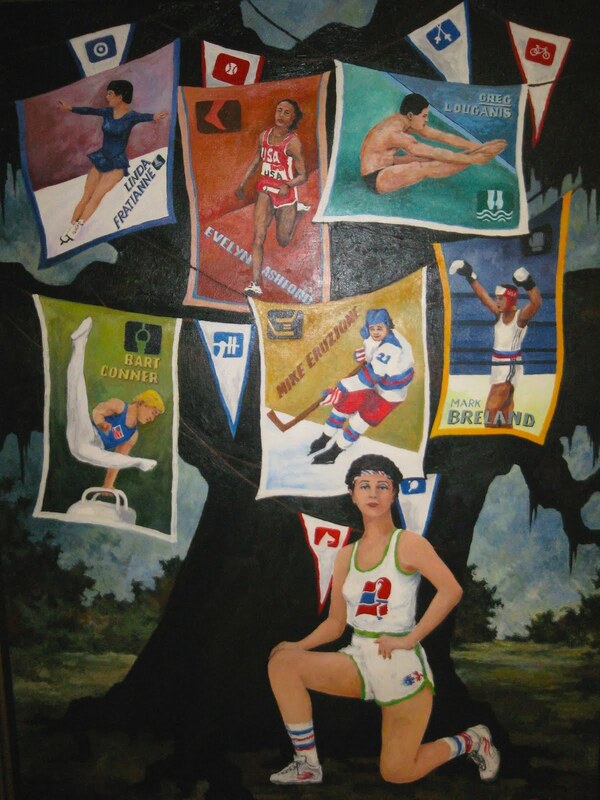 In the foundation we display a permanent record of a 45-year career, using paintings from our private archives, pieces normally hidden away in a warehouse storage bin (resting, a favorite museum excuse), some of them, such as The Spirit of the Next Hero (pictured below and detailed here), in the open air for the first time in 25 years. “Why doesn’t he sell paintings like this in the gallery?” they wanted to know, as I explained that there simply aren’t any available, just as there aren’t any of the earlier Blue Dog paintings available. 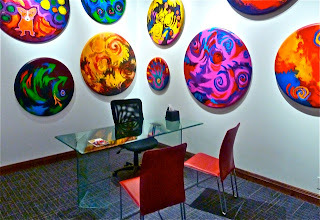 Everything is one-of-a-kind, and everything is in private collections, I continued. The gallery displays the most recent work, an exhibition of George’s important canvases of the moment, sometimes still drying even as we hang them on the walls. At the top of my list were Jean Bragg’s exhibition of Oscar Quesada, Mallory Page’s Minimal Glam, Jonathan Ferrara’s Stephen Collier and Generic Art Solutions, the latest by Steve Martin and Jamali at Steve Martin Fine Art, box assemblages by Audra Kohout at Herriard-Cimino, works by Robery Gordy and Tina Girouard at the Contemporary Art Center (reviewed here in Gambit), and last but not least the new Avery Fine Perfumery on St. Joseph Street, the very idea of the place triggering a re-read of Tom Robbins’ Jitterbug Perfume. 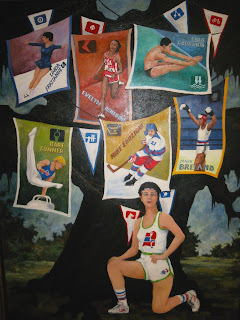 Undeterred, I’ll visit the galleries this week, enjoying these exhibitions and more within the air-conditioned quiet before donning my ‘dirty linen’ for an equally fun and artsy event in the French Quarter this Saturday. 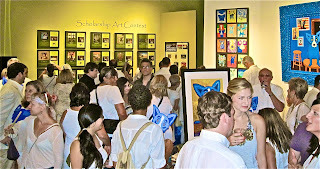 -also, don't miss Times-Picayune art critic Doug MacCash's White Linen re-cap; he hit it all! Sorry I missed it! What a Summer blast! 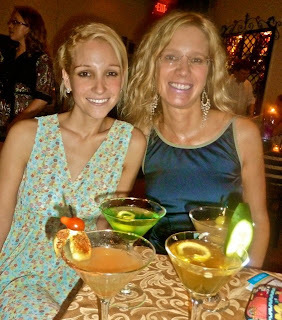 It was such a pleasure to meet you at White Linen Night! I'm really excited about working with you next month. I know you probably met a bajillion people Saturday night, but if you recall our brief conversation, I wanted to share the following: your excitement over having an event in YOUR hometown was contagious. 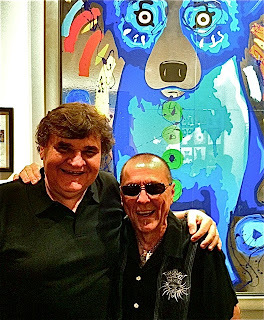 Your clear pride in FWB and excitement about bringing George's work to the Emerald Coast made an impression on both my husband, Kelcey, and me. We talked about it on the Sunday drive back to FL; you made US feel excited about living in Okaloosa County! Hi KC! Thank you for your comments, thank you for visiting New Orleans recently, and thank you especially for your work with the Mattie Kelly Arts Center! I can't tell you how much I'm looking forward to our upcoming visit. George too has always loved the Destin/FWB area and has many memories there. We'll see you soon!